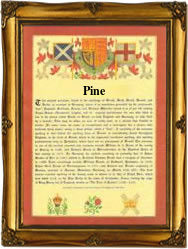 This interesting surname, with variant spellings Pyne and Pinn, is of Anglo-Saxon and Old French origin, and derives from the Olde English pre 7th Century, or Old French "pin" meaning "pine" and was originally given as a topographical name to one resident by a conspicuous pine tree or in a pine forest. In some instances, the name may be locational from Pinn in Devonshire, a place named with the above word. One Thomas de Pyn was recorded in the 1273 Hundred Rolls of Devonshire. Combepyne and Upton Pyne (Devonshire) were held in the 13th Century by a family of de Pyn who are believed to have come from Le Pin (Calvados). Early recordings of the name include: Morin del Pin (Leicestershire, 1130); Thomas de Pyne (Somerset, 1277), and John atte Pyne (Cambridgeshire, 1327). In other cases, Pine originated as a nickname for a tall thin man, supposedly resembling a pine tree as in Henry le Pyn, the 1332 Subsidy Rolls of Sussex. The first recorded spelling of the family name is shown to be that of Bonde Pine, which was dated 1101, in the "Records of St. Benet of Holme", Norfolk, during the reign of King Henry 1, known as "The Lion of Justice", 1100 - 1135. Surnames became necessary when governments introduced personal taxation. In England this was known as Poll Tax. Throughout the centuries, surnames in every country have continued to "develop" often leading to astonishing variants of the original spelling.